Daniel Boone, check. The gentleman who first observed the moon (presumably, Adam), check. One of the great and legendary rarities of American children's literature, with only seven copies found in library holdings worldwide and only three copies appearing at auction within the last thirty-six years, has come to market after a sixteen year dry spell. 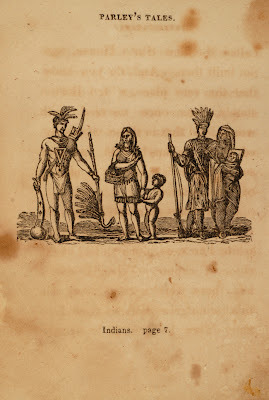 The Tales of Peter Parley About America was the most important American children's book issued up to its time of publication, 1827, and a major, highly significant influence upon children's literature in the English-speaking world forever afterward, soon drawing otherwise adult-oriented authors to the field. Samuel Griswold Goodrich, a Boston publisher writing under a pseudonym, wrote it to remedy the sorry state of contemporary juvenile literature. At the time, juvenilia was a heavy-handed, pedagogic, moralistic, dull, drab, and dreary branch of literature; otherwise unremarkable tracts remarkable only for their soporific qualities. "Though I was busily engaged in publishing various works, I found time to make my long meditated experiment in the writing of books for children. 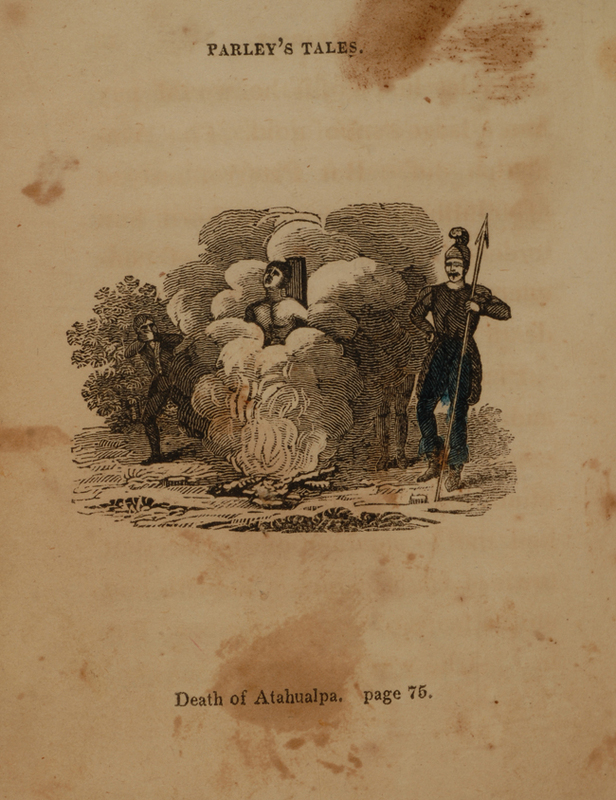 The first attempt was made in 1827, and bore the title of The Tales of Peter Parley About America. No persons but my wife and one of my sisters were admitted to the secret - for in the first place, I hesitated to believe that I was qualified to appear before the public as an author, and in the next place, nursery literature had not then acquired the respect in the eyes of the world it now enjoys. It is, since that period, that persons of acknowledged genius - Scott, Dickens, Lamartine, Mary Howitt, in Europe, and Abbott, Todd, Gallaudet, Miss Sedgwick, Mrs. Child, and others, in America - have stooped to the composition of books for children and youth" (Goodrich, Recollections of a Lifetime, pp. 279-80). Though starting slow, sales soon ran wild. "I published my little book, and let it make its way. It came before the world untrumpeted, and for some months seemed not to attract the slightest attention. Suddenly I began to see notices of it in the papers, all over the country, and in a year from the date of its publication, it had become a favorite. 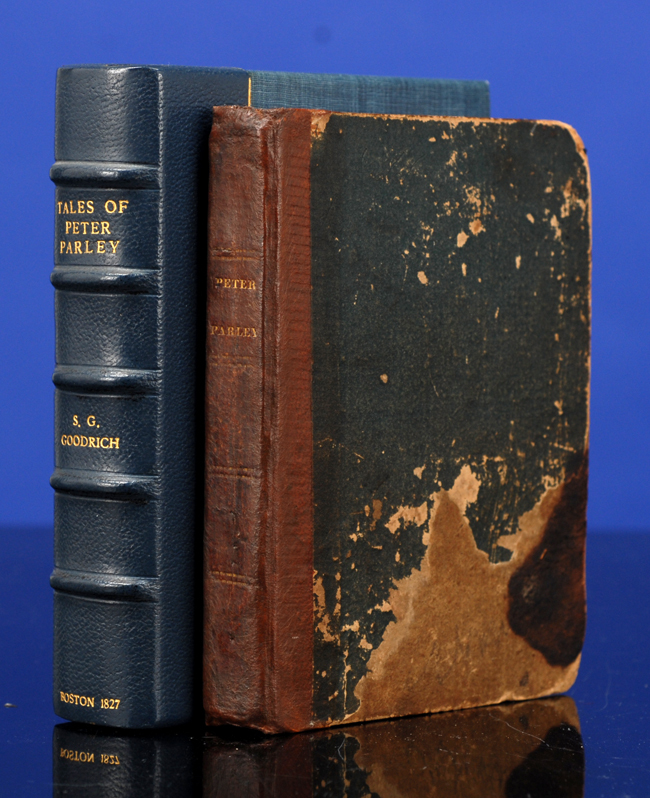 In 1828, I published The Tales of Peter Parley About Europe; in 1829, Parley's Winter Evening Tales; in 1830, Parley's Juvenile Tales, and Parley's Asia, Africa, Sun, Moon, and Stars. About this time the public guessed my secret - it being first discovered and divulged by a woman - Mrs. Sarah J. Hale, to whom, by the way, I am indebted for many kind offices in my literary career - yet I could have wished she had not done me this questionable favor. Though the authorship of the Parley books has been to me a source of some gratification, you will see, in the sequel, that it has also subjected me to endless vexations" (ibid). Other books were written for the series, many reprinted in England, and many more books issued by unscrupulous publishers who co-opted the Peter Parley franchise that Goodrich had established. 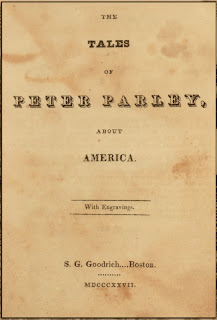 "By the mid-1830s the name Peter Parley was a household word with the juvenile reading public of the United States of America" (Quayle, Collector's Book of Children's Books, pp. 57-58). 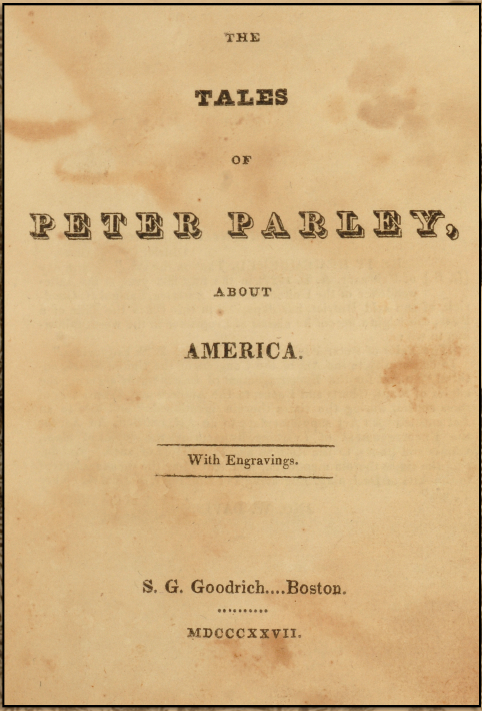 The Tales of Peter Parely About America "was followed by more than 100 other volumes with the Parley name. In these books a kindly and omniscient old gentleman is represented as talking to a group of inquiring children and instruction is given a thin sugar-coating of fiction. 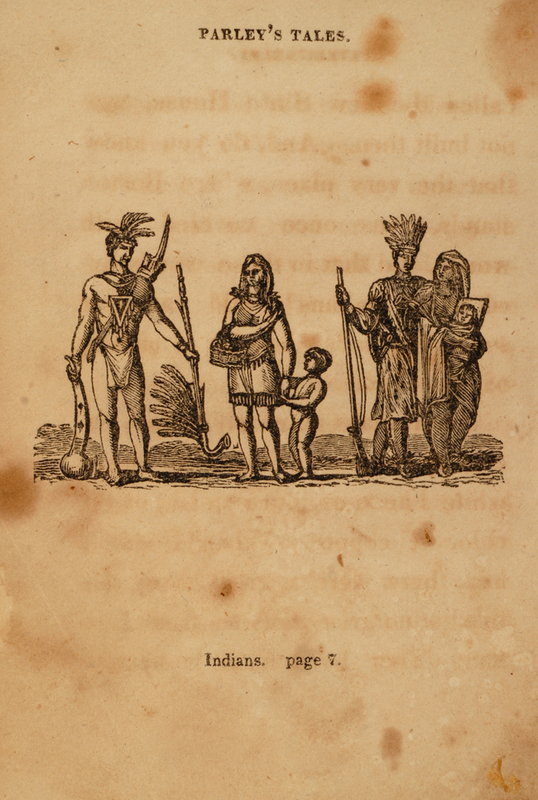 They met the educational needs of the time and sold by the million" (Dictionary of American Biography). "I shall not weary you with a detail of my proceedings at this busy and absorbed period of my life. I had now obtained a humble position in literature, and was successful in such unambitious works as I attempted. I gave myself up almost wholly for about four years - that is, from 1828 to 1832 - to authorship, generally writing fourteen hours a day. A part of the time I was entirely unable to read, and could write but little, on account of the weakness of my eyes. In my larger publications, I employed persons to block out work for me; this was read to me, and then I put it into style, generally writing by dictation, my wife being my amanuensis. Thus embarrassed, I still, by dint of incessant toil, produced five or six volumes a year, mostly small, but some of larger compass" (op cit., Goodrich). Millions may have been sold but few copies have survived; they were literally read to bits by children, who were utterly captivated. 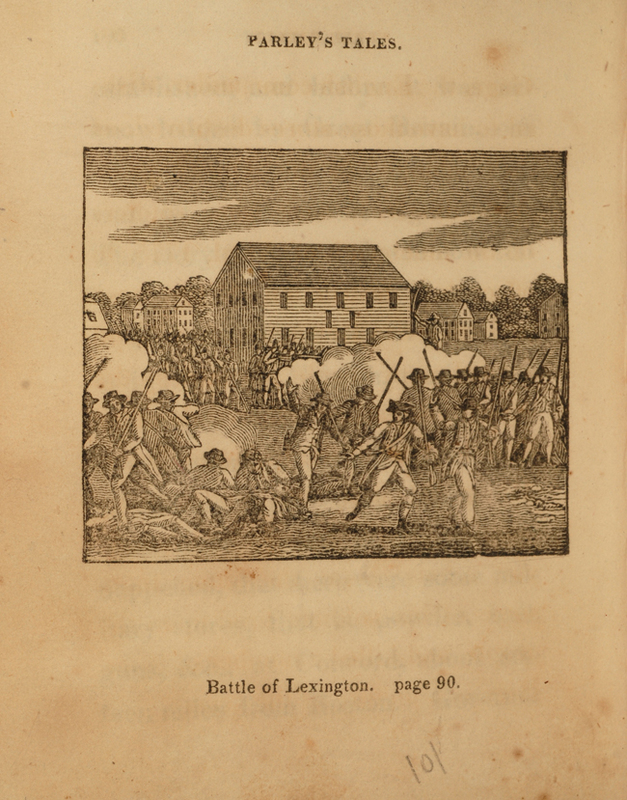 "This neat little volume is very happily adapted to the class of readers for whose use it is intended. It furnishes a very entertaining narrative, embracing a good deal of useful information. Books of this kind, we hope, will soon become more numerous than now; and the author of this volume will doubtless find it worth while to proceed with the series which he has so successfully begun. The same neatness of execution which characterises the present will be a valuable recommendation to subsequent publications" (American Annals of Education, 9 : 512 [August 1827]). For all his achievements, however, with children's books, Peter Parley, alas, never picked a pack of pickled peppers. That honor lies with and shall forever remain the property of that other mainstay of juvenilia, Peter Piper. PARLEY, Peter (pseudonym of Samuel Griswold Goodrich). The Tales of Peter Parley About America. 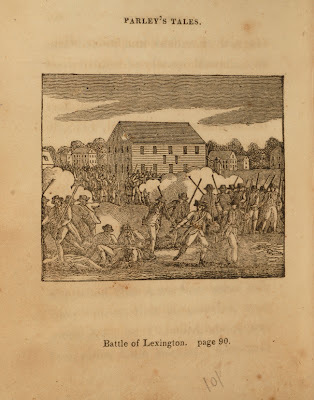 Boston: S.G. Goodrich, 1827. First edition. Twelvemo (5 1/4 x 3 3/4 in; 133 x 95 mm). [2, blank], iv, [1, blank], 5-142 pp. 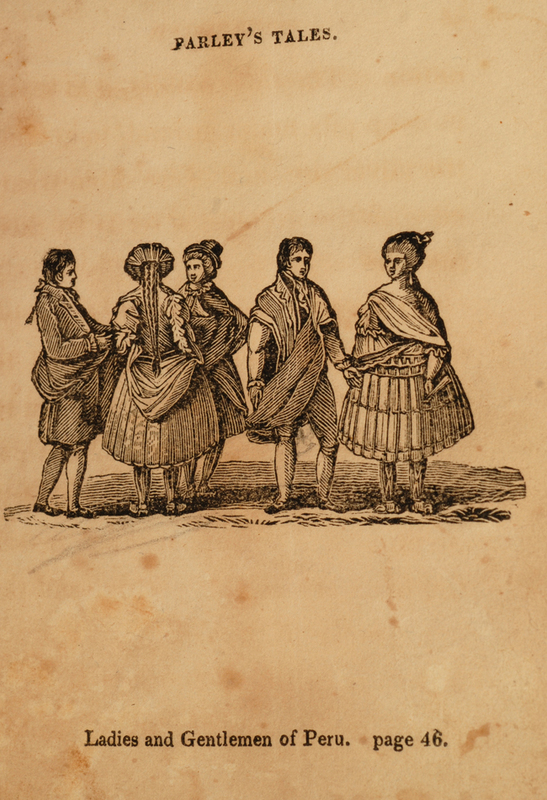 Thirty-six black and white wood engravings on thirty-two plates. Publisher's original rust-red leather spine over blue boards. Blanck 1. Grolier American 35. Morgan, Children's Literature 49.